Neustadt an der Aisch – "With the Bavarian Soccer Association (short BFV for Bayerischer Fußball-Verband) we are happy to have won an important partner in popular sports", says Ulrich Dietzel, Product Manager of Onlineprinters GmbH, enthusiastically. 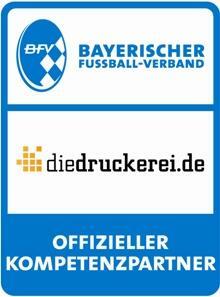 The new cooperation comprises the offer of printed materials of the online print shop diedruckerei.de for the clubs and members of the BFV as well as the sponsoring agreement of Onlineprinters GmbH with the soccer association. "Being a good value online print shop with a wide array of printed products in offset and digital printing, we can easily accommodate the demands of the clubs and their members", Dietzel summarizes the benefits of the partnership. The BFV is the umbrella organization for 4,500 clubs and more than 30,000 teams and junior teams. Each club has its own requirements of posters, flyers, leaflets for events, tickets or club journals for tournaments and stadium news. "Advertising for one's own events is becoming increasingly important considering the multitude of competing offers in amateur sports", Roland Mehltretter, project and sponsor manager at the BFV, observes. "The more attractive a printed product is designed, the higher is the awareness for the actions of the soccer clubs." With the expert partnership of Onlineprinters GmbH, those responsible for club advertising will not be in the offside position as they can count on many a deep forward pass from the print portal diedruckerei.de. For the layman, the menu item "Tips for print file creation" offers detailed information on frequently asked questions, for example "How do I create a PDF file?" The clearly arranged product selection offers product-specific information on all printed matter and complete marketing tools at the click of a mouse. Technical details and prices as well as production and delivery times are available for each print product and quickly answer any open questions. Shipping is free within Germany. If you have no experience with www.diedruckerei.de, you can find the ratings and opinions of other customers concerning prices, service and quality in the online shop. "We have 99 percent customer satisfaction", says CEO Walter Meyer. "Onlineprinters are looking forward to enhancing their fan community with the BFV."